The Mazda 3 offers a robust engine, engaging handling and a stylish design inside and out. The four cylinder engine gets you though the daily driving duties with ease. But the 17 inch wheels didn’t do the car justice! We fitted a set of 19 inch BD-3’s in silver to make them a stand out on the vehicle! The silver rims make them pop of the dark exterior and add a noticeable difference to it. Driving is dynamic and the handling is a dream with the new BD-3’s fitted and the bigger rims make people take a second and third look at the stylish addition. The twisted mesh design of the BD-3 is available in 19, 20 and 22 inch staggered sizes. The BD-3 available in a range of colors including; silver polished, graphite machined, all graphite and custom coloring is optional. The Veloster is anything but another hatchback. With its distinctive styling and strong turbo charged engine, it is a pocket rocket on the roads! 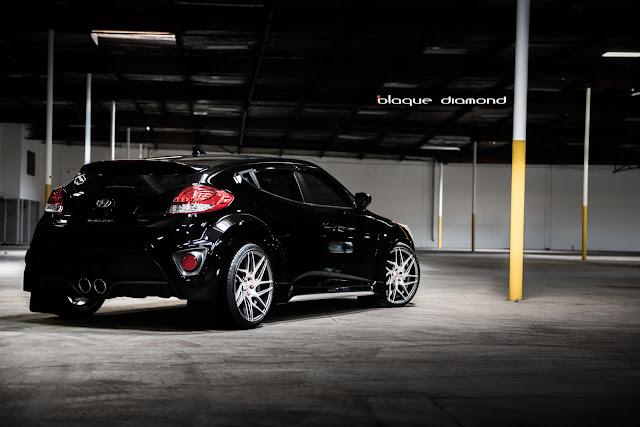 Triet had a set of 19 inch BD-3’s in graphite machine face to the Veloster R-Spec. It came standard with 17 inch alloy’s, but he wanted to push the limits and give his car a unique look that compliments the sporty exterior. While the twin scroll turbocharger helps get it to 201HP, the new rims makes those hair pin turns child’s play, while giving it a head turning look parked on the curb. The action packed Veloster now has the look and styling to rival the big boys. The BD-3's certainly make for an exciting addition to the hatchback. Blaque Diamond Wheels is giving away another set of BD Wheels to one of these lucky people! We had lots of great entries and here are the top 7 cars to vote for. Go to our Facebook page by clicking hereto vote for your favorite car to win a set of our wheels. By voting, you have the chance to win Blaque Diamond merchandise! 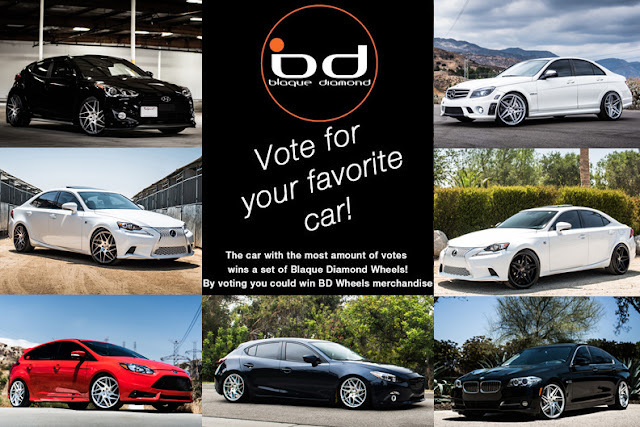 You can vote once a day for your favorite car. Competition ends 11:59pm, Sunday, September 6, 2015 so get voting and don’t forget to share this with your friends! Our recent photo competition saw seven cars battle it out to win a set of our wheels. The public voted on social media on which car they thought deserved the wheels. Every car looked great with our wheels on them, but there can only be one winner. 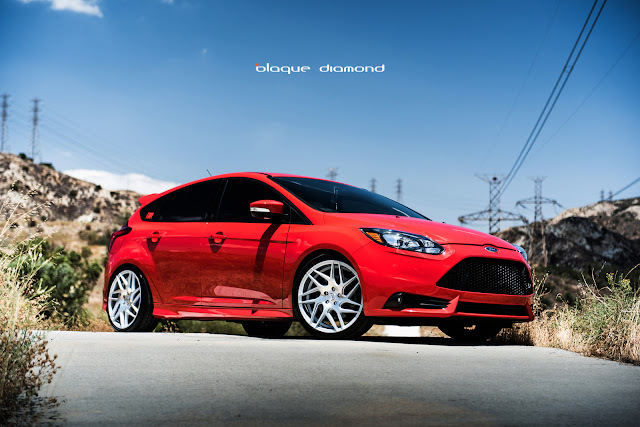 Jorge and his 2014 Ford Focus ST3 in race red took the win and now is the proud owner of a set of 19 inch BD-3’s in silver! 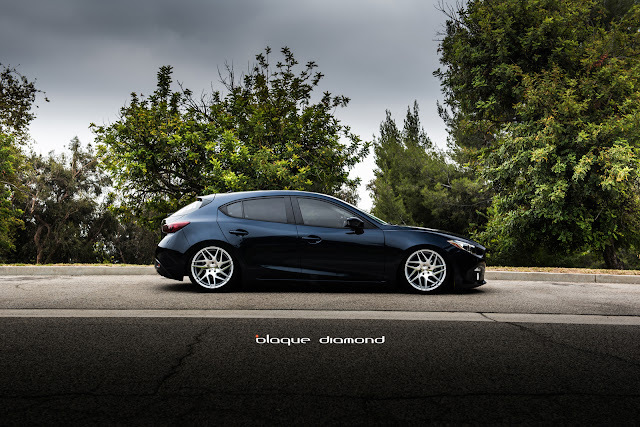 ‘Thank you Blaque Diamond for the opportunity and the new rims!’ Said Jorge. Check out all the pictures from Jorge’s winning Ford Focus here. 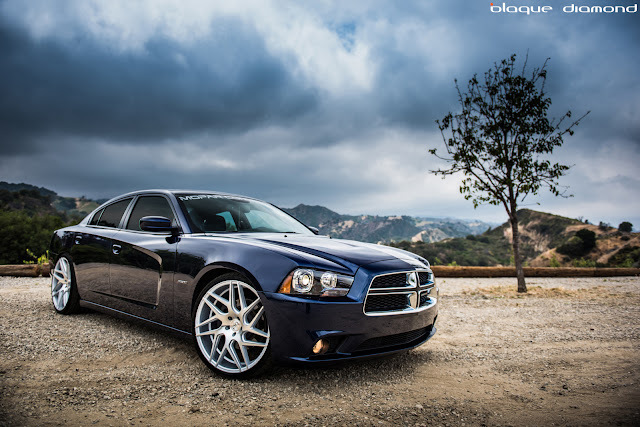 Dodge is a company that emphasizes performance and the 2013 Charger is no exception. With its bold looks and aggressive stance, no one can say it’s an average sedan with a big backseat. Bristling with bravado, the charger has the aura of masculinity all round. The standard 19 inch rims didn’t reflect this big, bold personality so we fitted a set of staggered 22 inch BD-3’s in silver. Cruising around with the new rims, the Charger became a punishing presence on the road. The dash up the straight is smooth and seductive while the bends were child’s play for the menacing Charger. The twisted mesh design of the BD-3 is available in a variety of staggered sizes. They come in 19, 20 and 22 inches. They are available in a range of colors including; silver polished, graphite machined, all graphite and custom coloring is optional. BD-1 and BD-2 in Two Tone Matte Black in STOCK NOW! Due to overwhelming demand we have produced the BD-1 and BD-2 wheels in two tone matte black. TheBD-1 is a skillfully crafted, concave, multi-spoke wheel with precise lines that roll out to a 6” deep undercut lip. The BD-1 in two tone black is available in staggered fitments of 22 x 9 and 22 x 10.5 with a deep angled concave wheel design. The BD-2 is a traditional 10 spoke design that adds a touch of modern with its deep concave profile. The BD-2 in two tone back is available in staggered fitments of 22 x 9 and 22 x 0.5. The BD-1 and BD-2 has huge versatility, which appeals to the widest audiences. They can be fitted to most vehicle makes including; BMW, Mercedes, Audi, Range Rover, Lexus, Infiniti, Chevy, Chrysler, Honda, Hyundai, Mustang, Dodge, Nissan, Toyota and Volkswagen to name a few. Check out all of our wheels on a variety of makes and models in our gallery here. When you have a superstar NBA player wanting a set of our wheels fitted to his car, you know you have to give him something extra special. James Ennis grew up in California and attended Cal State University Long Beach. In 2013 Ennis sign with the Perth Wildcats to play the 2013-14 season in Australia. He was named the MVP for the 2013 -14 season. In July 2014 Ennis signed with the Miami Heat where he remains to date. The A6 comes standard with 19 inch wheels. We knew we needed something OTT to make it stand out. We fitted custom colored staggered 22 inch BD-8’s in candy red. The contrast from white to red makes Ennis’ car a striking presence on the road. Audi is no stranger at creating modern masterpieces and with our candy red BD-8’s fitted, it now hits that sweet spot with his fans on and off the basketball court. Vote For Your Favorite to WIN! Blaque Diamond Wheels is giving away a set of BD Wheels to one of these lucky people! We had lots of great entries and here are our top 7 cars to vote for. 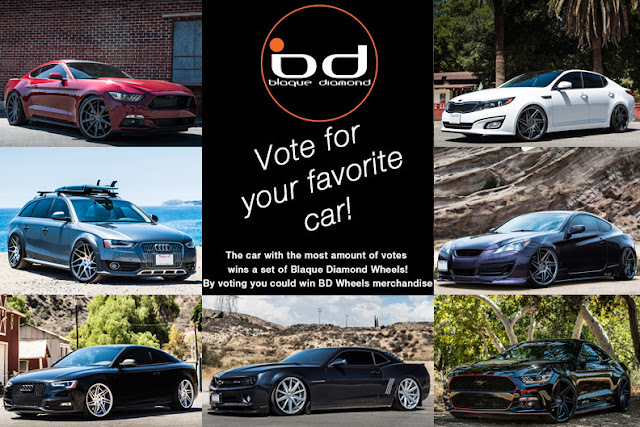 You can vote once a day for your favorite car. Competition ends 11:59pm, August 14, 2015 so get voting and don’t forget to share this with your friends!